Two second place finishes and a sixth place in the fifth round of the British F3 International Series at Brands Hatch in Kent, England has kept Jazeman Jaafar in the lead of the Drivers’ Championship. The 19-year-old Malaysian has finished every race of the championship in the top six so far this season, and scored at least one podium in every race weekend, an impressive statistic for the young driver. Jaafar’s weekend started strong, with fifth quickest lap times in both of the Friday practice sessions. After the engineering debriefs and further set up development, Jaafar put in an excellent performance for the qualifying session. Posting the quickest lap time in the early stages, the young Malaysian was pipped to the pole in the last few minutes of the session by Carlin team mate, Jack Harvey. However, Jaafar’s consistently strong laps with new tyres put him second on the grid for the first and third races. The first race of the weekend on Saturday afternoon was held in cloudy, overcast but dry conditions. Lining up second on the grid Jaafar had a good start, but pole sitter Harvey was quick off the line and Jaafar was battling Alex Lynn behind. Jaafar kept his foot down through Paddock Hill, running through the next corner on the outside of Lynn, to put his stamp on second place. Jaafar’s fight with Lynn allowed Harvey to pull out a gap of over 1.5 seconds, but the Malaysian driver quickly set about hunting him down. Over the course of the 22 lap race, Jaafar clawed back tenth after tenth, but finally ran out of laps in which to overhaul his title rival, finishing in second place at the chequered flag. Sunday morning’s sprint race, with its semi-reversed grid, started with Jaafar in tenth position on the grid. 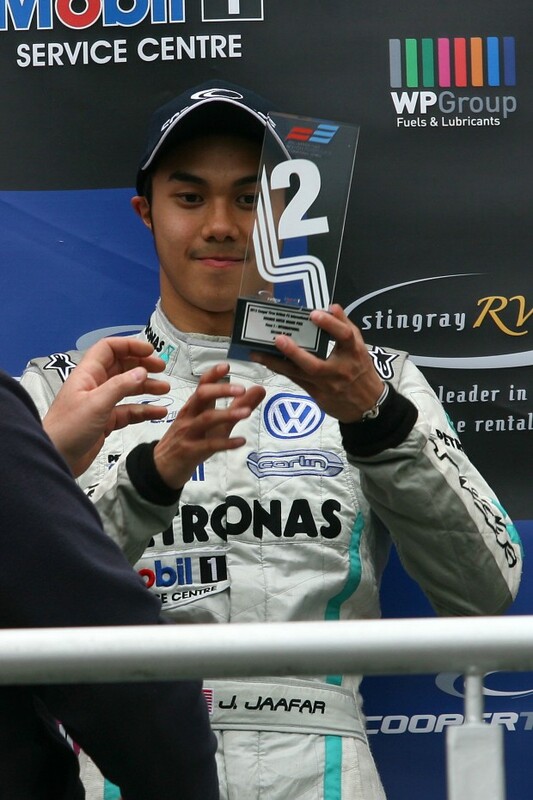 The PETRONAS Talent Programme driver made a lightning start to be sitting in sixth position by the end of the first lap. Polesitter Fahmi Ilyas took the lead initially, but after pressure from the pack ran wide, rejoining the track just ahead of Jaafar. Although Jaafar had a quicker car than Ilyas he was unable to find a way past him, finally taking the chequered flag in sixth and adding more valuable championship points to his total. The final race of the day was the 40 minutes Feature race and Jaafar lined up second on the grid for the start. He sprinted off the line as the red lights went out, but his rival on pole, Harvey, was also away quickly, so the two front runners filed through the first corner with Jaafar hard on the rear wing of his rival. With evenly matched pace the two drivers pulled away from the pack behind, but Jaafar was unable to get close enough to Harvey to pass. After 30 laps of the Brands Hatch circuit, the positions remained the same with Jaafar claiming his eighth podium finish of the season. Jaafar now turns his attention to the next event in the British F3 Series, with the sixth round taking the championship to mainland Europe, racing at Norisring in Germany.